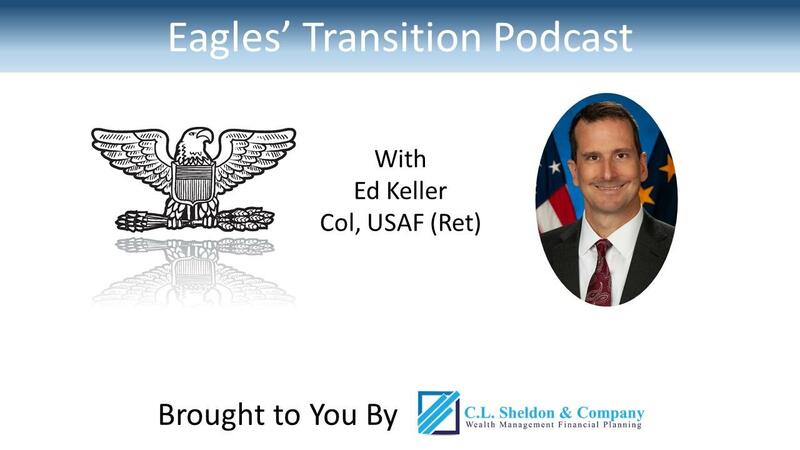 Speaker 1: Welcome to The Eagles Transition Podcast where your host, financial planner, speaker, and author Curt Sheldon, talks to senior military officers who have made the retirement transition before you. You'll hear about different hiring processes, interview questions, salary negotiations, and how each one of them successfully settled into a rewarding second career. Now here is your host, Curt Sheldon. Curt Sheldon: Welcome to episode 11 of The Eagles Transition Podcast. Today, I'll be talking with Ed Keller. Ed has reentered government service as a senior executive, or SES, as the Associate Executive Director for Procurement Policy, Systems and Oversight at a large federal agency. You'll want to make sure you listen to Ed as he describes the rather arduous application process required to enter the Senior Executive Service. Ed also talks about working with an executive coach, and I found that very interesting. If you're interested in becoming an SES, make sure you check out the resources he recommends. Curt Sheldon: Before I talk with Ed, I'd like to make a special offer for our podcast listeners. If you go to www.clsheldon.com/eagles, that's www.clsheldon.com/eagles, you can get a financial checklist to help with your transition from active duty to the civilian world. It is designed for you, and you can get it for free. Now on to the show. Curt Sheldon: Ed, welcome to the show. Ed Keller: Hey, Curt. Thanks for inviting me. Curt Sheldon: I'm excited to have you on today because you're in an area that I haven't had a chance to have anyone or to speak with anyone about, and that's the ... You are government service, but I'll say I'll let you say what level you're at and what you do. Ed Keller: I'm in the Senior Executive Service, so it's an SES position. I am the Associate Executive Director for Procurement Policy, Systems and Oversight for a large civilian agency. Curt Sheldon: Okay. I want to kind of pause there for a little bit and talk about it. We were talking the other day, and you said something that I had never really thought about in what the SES corps is. I mean as an active duty, when I was on active duty, always heard SES is a general officer equivalent, and I always thought of it as kind of like we do in the military. You come in as a lieutenant. You work your way up. If everything goes right, all of a sudden, or after 20, 30 years, there's some stars on your shoulders if everything aligns. Really, from what you described, that's not how one should envision a SES position is. Could you expand on that a little bit? Ed Keller: Sure, right. The SES is often viewed that way, as the next step once you're a GS-15, which is essentially a colonel equivalent in the military. It's often viewed as sort of the next step, and it often is. However, it really was designed as a separate system to hire those people but also to hire people from other walks of life, including academia, industry, all sorts of places. Ed Keller: It has a separate hiring process, separate hiring authority, and does not require you to have that civilian background prior to taking one of the positions, and so like in my case, I was military all the way, just about. You apply, and they have it set up so that you can use your background to qualify, and so that's how it should be viewed. The role of the SES is to sort of serve in between that workforce, that GS-15 and below, and the political appointees that come into the agencies. They sort of serve as that leadership stability in that senior role but in that position. Curt Sheldon: Okay, thanks because, again, as I mentioned, I had the perception that it's a position that you pretty much grow into, so that's at least a good place to get us started thinking about it the right way. As you did mention, you were in the military prior, so what was your last position in the military? Ed Keller: I was the Director of Contracting for the Air Force District of Washington. My role there was our entire office was to support the contracting needs of the Air Force Pentagon, so all the major headquarters. Air Force and Secretary of the Air Force offices, they're there in the Pentagon as well as the other government, excuse me, Air Force agencies within the National Capitol Region. We supported them with all their contracting needs. A lot of that was advisory and assistance services, IT and that kind of thing, but it wasn't really the contracting work itself that made it unique. It was the customers who were all very senior people, very senior staffs, and so that was an interesting place to finish up. Curt Sheldon: Okay. If you could, kind of give us a thumbnail on your overall career. Ed Keller: Sure. I did 28 years in the Air Force. It was almost all in contracting and acquisition positions but in a variety of settings, obviously, to include two commands, one of them which was in a deployed location, and three deployments so ... and also at the Pentagon. As with most careers, there was a lot of variety, a lot of different places, and then you work up into each level of responsibility. It really prepared me for what I'm doing now for sure. Curt Sheldon: Good, great. Now, I do know that, and you kind of alluded to it, this is not your first position post retirement, so now could you kind of talk to us a little bit about the path that led you to your current position? Ed Keller: Sure. When I was retiring, I did the whole networking thing, of course, and that really led me to being contacted by a government services provider contractor. They wanted me to serve as a consultant, a [inaudible 00:06:36] to the Air Force, largely. They were divided kind of along those lines. I worked for a little over a year with this contractor as a consultant and mostly servicing the Air Force. Curt Sheldon: Okay, so you mentioned that your network was important for you finding that position. Could you expand on that a little bit? Curt Sheldon: Yeah. Why don't you talk a little bit, I think, and it sounds like that's probably one of those ... I don't remember the numbers, but when I teach at ETAPs, you hear that, at our level, most jobs don't show up as advertised jobs. They're filled without ... Someone's selected and brought in. Sounds like that's kind of what happened with you, but again, I'm sure there was a formal hiring process. Ed Keller: Well, there was. I don't know if this is true of a lot of consulting firms. It would seem that it would be, but you're almost brought in as a strategic hire. They're looking to have a bench of people that have certain skillsets and so that they can approach their government customer with these skillsets. I was invited to lunch, and the lunch went really well, and then they invited me to their corporate office where I met with a bunch of other people. Ed Keller: It was only after that that I received a formal offer, and even that was timed. I mean they were kind of happy to hold on to it as long as I wanted them to, but they came in with an offer, and it was entirely built on the network in that case. I would say that the formal hiring was more of an afterthought in that particular case. They had me fill out an application, but it was seemingly after we'd already agreed to terms. I'm not sure how common that is, but that certainly was what happened in my case. Curt Sheldon: Yeah. The sample size for the podcast is a little small. You're episode 11, but that sounds ... On the more informal end, a lot of them, it seems like there's a meeting, maybe that lunch and, after the lunch, the folks are told to, "Put in application, and we'll be in touch." It sounds like that wasn't exactly what happened in your case. Okay, so you were there for a year and ended up, after a year, moved into your current position, which I'm thinking was ... the process was a whole to more formalized. Ed Keller: Exactly. I mean, first of all, I really liked the consulting job, but I did miss that feeling of ownership of the mission that you have, and I missed leadership. I missed being a leader and using all those skills that you have. I had applied to several SES positions even before I retired and had done a lot of the legwork that goes into that. It is very different and very formalized and lengthy. With the consulting job, they really seemed like they could hire me at any moment that I wanted to be hired. With the government positions, you go through this long process, and it starts with your application, which is extremely labor-intensive. Ed Keller: You have the ECQs which you have to prepare, which are the Executive Competency Qualifications, and then each job may have technical qualifications. It's a lot of writing. You have to really be up front. You have to really plan to do this and put the time in in order to follow through with this. The ECQs are a really important part, the executive competency qualifications. They will be usable no matter what SES job the person applies for because what they do is they cover areas of executive competency. There's five of them. Once you are hired, they put those through the OPM process, and OPM qualifies you, so you use the same ones for all the jobs you apply for. Ed Keller: Then the technical qualifications are job-specific, and so they typically will be more, "Tell me what you know about this particular area of expertise," and so they're a bit easier to write. The ECQs are very structured, and there's rules on how to write them, and they can only cover the last 10 years, and so some people will hire people to write them for them. I did not, but some people do and have success with that. Then, essentially, what happens is you follow a structured interview. Just like any government job you put in for, if you're among the highest qualified, you will get an interview. Ed Keller: The interview is also very structured. There are a list of four or five questions that they're going to ask everybody. They'll essentially have you take a look at those questions for 10 or 15 minutes before the interview, and then you'll come in and talk and answer those questions without a whole lot of interaction with the interviewing board, and so there's a skill in that as well. Ed Keller: Then, once you get that process, you'll be ... If you're selected, it still takes a while because if you're a new SES, they have to put your ECQs through the OPM process. They'll provide you with a coach. Usually, your agency will provide you with a coach who will review what you've written. Then that gets submitted to OPM, and you have to qualify through OPM, which is another board of SESs, before the agency can finalize your hiring. There's a lot to it, and that's why it's so very different than what I experienced in the private sector. Curt Sheldon: A couple things came to mind as you were discussing that. I had, really, no insight into the process other than I knew it was a challenge. Rough order of magnitude, you think, in hours do you think that it took you to put together your application? Ed Keller: I would say 75 to 100 maybe. Ed Keller: Couple of weeks, right, of ... Now, I didn't do it that way. I kind of wrote on them for several weeks just as I had time. Then what you want to do is, once you've got them written, they have to be strategic in nature. That sounds like that shouldn't be that difficult after ... if you're a colonel, but it really is difficult to sort of ... You have to make sure you delve into the tactical or even the operational level kind of a talk. You have to talk about, at a strategic level, numbers of people that were influenced and that sort of thing. It really is good to have people who ... written to make sure that you're on track because that's the hardest thing. I did that and had several of them revised because of that process. That give and take back and forth does take a little bit of time, so it is something you really have to plan ahead for. Curt Sheldon: Okay. You mentioned qualifying the ECQs with OPM. I wasn't quite sure. Is that a second interview process or they just review your written application? Curt Sheldon: Okay. That actually logged a couple other questions, one that I thought of a little bit earlier. I don't know the answer to this one way or the other. Is there anything equivalent to VA or veterans points, if you will, in the hiring process? Is there any preference given to veterans like there is on the GS side, or is that not considered at all? Ed Keller: There is not. It is expressly not included in the SES hiring process. I don't know the reason for that, but it is not part of it. Curt Sheldon: Okay, and then you mentioned time. To best of your recollection, from the time you pushed send on the application, if you will, to the time there was a job offer, how about how long did that take? Ed Keller: Wow. Now, I was in a little bit of an unusual situation because it was an election year and there was a hiring freeze because of that and a few other things, so it took a year or so. I think the normal timeframe from the time you apply to the time you get hired is probably closer to six to nine months, but it's still a crazy amount of time. I'm not quite sure how they manage to keep all these positions open, because they almost always have a long gap. It takes quite a while, once a person leaves one of these positions, even to get it posted, so it takes quite a long time. I mean months and months. Curt Sheldon: Okay, now ... Yeah. My understand ... Well, I guess I don't have that great of an understanding. Let's talk, in the SES world, is there much discussion on compensation, or is it, "You're an SES-1, here's your package?" Ed Keller: No, there's a range. It actually starts out to what I would consider to be not very competitive. It starts out at almost like what, in this area, I'm in the DC area, would be a relatively junior GS-15 and then goes up to above that. Ed Keller: In my case, they based it largely on what I was being compensated for in my private sector job, so that became a very important thing. They asked for my pay stub, and they essentially matched plus what I was getting from the consulting job that I had. Really, that sort of tells you, if you do take a private sector job, which is not a bad idea, be mindful that that salary will be your number that will be the basis for a lot of what goes on afterwards. That's how it worked in my case. They asked for a pay stub, and when the offer came in, it was just above that, what I had been paid before. Curt Sheldon: Okay. I guess, while we're there, was there much on the salary negotiations side when you were hired for the consulting job? Ed Keller: There was a little, yeah. I mean they had a number that I think was roughly what they thought would equate to what I was getting as a relatively senior O-6. I wanted it to be a bit more than that because of all the things that are involved in military pay, and so there was bit of a negotiation. I had a good sense, from talking to people, what I could reasonably expect, and I really tried to be realistic in what I asked for, and so we reached terms pretty quickly. I thought I was being compensated fairly. Ed Keller: I will just say that it is important in the private sector, in particular, to understand what your number should be, what the right amount should be. Don't be crazy in terms of the number. I mean you should try to figure out what it really is, but then you should really try to get it. You should try to stick with that because, once you get that salary, there's no automatic increases in private industry. It's not like the government where they're going to come around every year and give you a COLA increase. That'll be your figure until you get promoted or get a bonus or renegotiate your salary somehow. It's important to not just take the first thing they offer you and to really be educated on what fair compensation would look like for you. Curt Sheldon: Yeah. I've heard some others say, also, on the flip side of that is know what your yes is and, when you see it, then go ahead and say yes. Curt Sheldon: One other thing I wanted to hit on was onboarding. You've had two experiences, one in the civilian ... both civilian, but one government, one corporate. We do a pretty good job of bringing people on board and spinning them up in the military. What has been your experience there, a pretty good onboarding and training, or is it more of a, "Here's your desk. Good luck"? Ed Keller: Well, with the consulting firm, it was really easy. They assigned me a mentor, and it happened to be the same guy that recruited me. That really helped. They had also had a pretty good idea of which customer or customers they had in mind for me to be supporting, and so that really, really helped because, in the company I was in, you sort of eat what you kill. What business you bring in, that's your workload, and so it can be really tough, but in my case, they had a customer who had given them my name, and so they put me with that customer right away, and so I had a ready-made workload to start, so I thought the transition was pretty easy. Of course, coming into the company and sitting in your office and getting the computer set up was way easier than I've ever had, even in the military, in terms of the red tape you'd have to go through. Ed Keller: In the government, it's been okay, probably because I'm at an executive level. There's been some hand-holding like you would see in the military, but it's been pretty slow. There's a training program, and it'll be a year, year and a half before I get through all the training they want me to do as an SES. Just like everywhere I've been in government, the HR processes are kind of messed up. The IT setup is kind of messed up. That's been no different where I am now. A lot of that's been slow and sort of frustrating, but I wouldn't say it was any better or worse than other government jobs I've gone into when in was in uniform. Curt Sheldon: Okay, thanks. Now, you talked a little bit about letting your network know that you were retiring and what you were looking to do. Again, I think that's probably the number one, at least from what I hear from other people, is just let people know what you want to do, and they'll kind of figure it out from there. Anything else, specifically on the networking side, that you did that you thought was pretty effective? Ed Keller: Well, I would just say it's really important to realize that this is kind of time for you to get the word out, so that's number one, be public about what you're doing. I reached out to whoever I could and told everybody that I could. LinkedIn's important because you can sort of put it out to a lot of people on there, and it gives people an opportunity to check you out before they reach out, which I think is good. I even went on there and identified people who had retired before me who maybe I didn't even know who would be amenable to talking with me, and all of them were. I would cold-call people and say, "Hey, look, I see you're with this company. I'd like to maybe have a cup of coffee or talk to you on the phone about your experiences transitioning," and they were very supportive. Almost 100% of them were. Ed Keller: Then I would even call people that were not military that were in my particular career field. I was lucky because I'm an acquisition officer that ... There's a lot of people who were never in the military who do that very job, so I would call them up directly or send them a note on LinkedIn. You can get a free membership to LinkedIn for a year as a veteran, and so you can message people and all. It was really great to do that. I don't know that I got a job directly because of that, but I really did a lot of work in that pretty hard. Ed Keller: I've learned too that, now that I'm in this job as an executive-level person as well, having all these relationships is important too for consultation, about problems you run into, to get references for people who maybe apply for work with you. It's good to have a big network even for your work life. It's not always something that comes natural to military officers because we sort of live in our own world, but I found people to be very receptive to talking with me about what I was trying to do. Curt Sheldon: Yeah, and I found the same thing when I was making the transition. I had contacted some financial advisors. I basically cold-called them and said, "I'd like to talk to you about the business," and, to a person, nobody ever said no, so that's ... People are out there and willing to help if you're willing to reach out. Curt Sheldon: One of the things that I think changes for a lot of us when we retire is money maybe. Any surprises there or observations that you might want to pass on to the folks about money lessons that you learned? Ed Keller: There's a lot of complexity. Now, I knew that. I knew that I was in over my head because I had rental properties, and I had ... You have the pensions that you have to deal with that you've never dealt with before. You have the VA. Most of us would have a state income tax issue because, if you had anything on the ball at all as a military officer, you figured out pretty quickly that you needed to be in a no-tax, no-income-tax state, so if you retire like where I did where there is income tax, you had to deal with that. Then, of course, the overall tax implications of your income going up and that sort of thing, so you just have to assess all that and determine if you have a handle on it, because there is a lot more complexity, particularly on the tax side, once you're out and making more money than you were before and all these streams of income that you didn't have before. It can be quite daunting if you're not thinking about it up front. Curt Sheldon: Okay, thanks. We've covered a lot of ground. Any other resources that you found particularly useful, either online class, or courses, or just books? Anything that you would say people might want to take a look at? Ed Keller: Well, the ETAP class is really good, I thought. There's things that are better in it than other things, but they do give you some good experience and advice. For the SES positions, in particular, the OPM website has a great deal of information on there about how to prepare, and what the process is, and what the criteria is in terms of writing these ECQs that I've talked about and so it's really helpful. You can, of course, google all the other agencies that do this and learn a whole lot. As I said, agencies themselves, once you're hired, will provide a coach, so you won't be left to your own devices. Ed Keller: The other thing I have now that I'm been hired, my agency provides an executive coach for the next year or two. I never had an executive coach before, but I have been pleasantly surprised at how much of a benefit that's been in terms of working through problems and sort of thinking about what's next and what's ahead and all that. If you have an opportunity either to pay for your own or through your company or agency to have an executive coach, I would give it some real thought because I was a skeptic, but I've been really happy with that. Curt Sheldon: That's interesting. I think you're the first one that I have talked to that has mentioned that. That's one I think speaks well of the agency that they're providing that. It's interesting. I could see where I would be skeptical too because you've been in leadership and at an executive level for years, and I could see where ... Like I said, I could see where I would be skeptical too. Anything surprise you in the last few years since retirement? Ed Keller: Well, we talk about the process for the SES. How long it took was really a surprise. It was amazing to me. When I got called for my interview, I had to ask them which job this was for because it had been so long since I had applied. Ed Keller: I think the other thing that was sort of surprising to me was, as you're getting ready to retire, you feel the time ticking, and you feel this pressure, and so you take a job, but once you're out, there's a feeling of being a free agent, if that makes sense, that you're sort of ... The next decision and the decisions after that are all on you. Unless you have trouble at work, you're going to be there as long as you decide to stay there. If you want to leave, you leave, or if your company decides to merge with somebody else and you get let go, but you're a free agent. Ed Keller: There's nobody looking out for you and your career. There's no career manager like there is in the military. There's nobody telling you, "In three years, you're going to move," and so that was a surprise to me to sort of ... that feeling of being a free agent. It's a good thing and a bad thing. I mean it's sort of a difficult thing to get used to, but that's been the biggest surprise, in terms of my own psyche, of sort of what stood out to me as I've hit this phase of my life. Curt Sheldon: Okay, thanks. That's interesting. That free agents, that's a good term, I think. As I do in every podcast, I like to give the participants a chance to pontificate, if you will, about anything that you'd like to that we haven't covered already. Ed Keller: Well, thank you. I think one of the best pieces of advice that I was given as I was approaching my retirement was to take your terminal leave. I really think that's important. I think that there's a lot of us that sort of feel like, "I need to just move into this next phase and hang my uniform up on a Friday and walk back into my next job on Monday." I really would advise people not to do that. I think that I gained a lot by taking that break and kind of reassessing kind of where things were and spending time with the family and all. You're not going to get too many opportunities in your mid-career to take a month or two off, so that's number one. Ed Keller: Then, as I said earlier, just let people know what you're doing. They're always out there to help you. You've met a lot of people throughout your career, and they all have either been through this or will go through this, so don't hesitate to call people. As you said, nobody ever hesitated to help, and I certainly would never hesitate to help anybody. Those are the two biggest points of advice that I would have. Curt Sheldon: Okay, thanks for that. Since you mentioned that, reaching out, what are good ways for listeners to get in touch with you? Ed Keller: You can find me on LinkedIn under Ed Keller. I think it'll pop up relatively quickly. Also, my email is afpirate89@gmail.com. Anybody can send me a note, and I'm happy to talk to anybody that's transitioning and sort of pay it forward. Curt Sheldon: Okay. Thanks, Ed, for that. With that, we'll wrap with the question I always end the podcast with. Think you've been retired a couple years now, maybe three, and so we're back there 36 months, 48 months ago, you're 6 to 12 months prior to retirement. What do you wish you knew then that you know now? Ed Keller: I would say not to worry, which is really an easy thing to say now that I'm on this side of things, but really, if you network and you prepare and you put in the work, I really believe that it'll all work out. All of us that have reached this stage in life typically know how to handle ourselves in a situation, the situations that you're going to find yourself in in terms of putting your best foot forward and interviewing well and all that sort of thing. I think that that's the biggest thing that I would say is just follow the process, do the work that's necessary, and it's going to work out, and it's okay on the other side. That's the other thing. It's just fine over here. Curt Sheldon: All right, Ed. Thanks a lot. Again, I really appreciate your taking the time to talk with me today and spread the word about something that probably more of us think we know something about, that being the SES realm, than what we really do. Speaker 1: It's not easy balancing the demands of active duty and searching for your second career. That's why we put together a retirement financial checklist tailored for senior military officers. With it, you'll organize your financial affairs and avoid mistakes when you retire. The best part is it's free. You can get it at clsheldon.com/eagles.